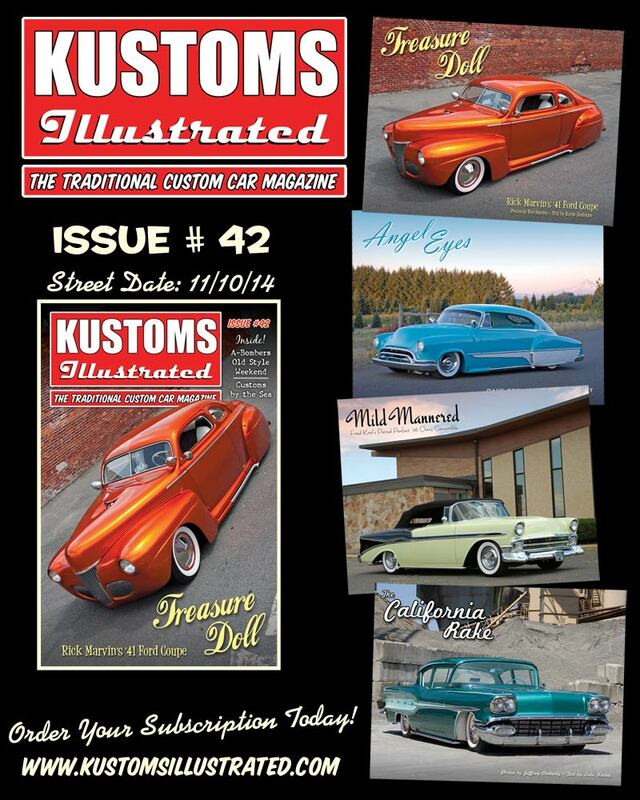 Press Release: Issue #42 of Kustoms Illustrated Magazine is hot off the presses and will begin mailing early week 46! 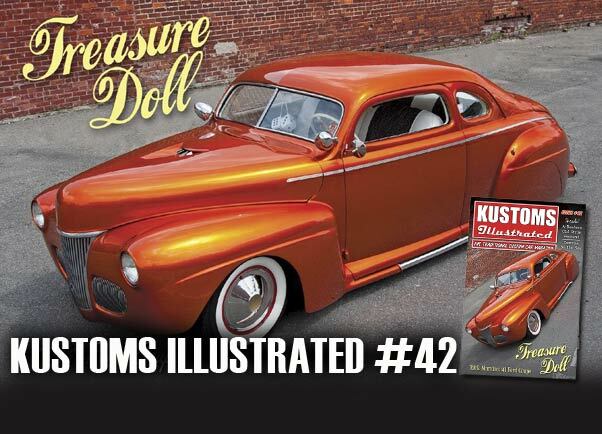 In Kustoms Illustrated issue #42, we have an incredible line-up of great looking customs and event coverage tailored specifically for the traditional custom car enthusiast. From the East Coast to the West Coast, from the Mid-West to Overseas, we’ve got it covered! 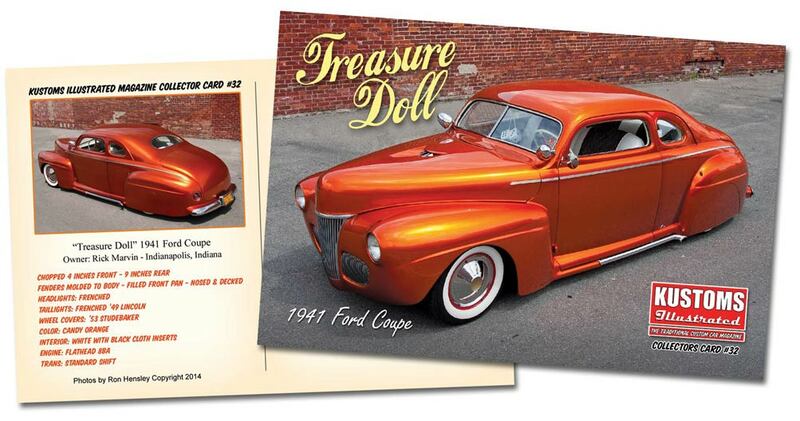 Our feature cars this issue include Rick Marvin’s glowing ’41 Ford coupe from Indiana. This beautiful custom features all kinds of neat tricks and fresh new ideas that you just have to see. Next, we photographed “Angel Eyes” against the breath-taking backdrop of Mount Rainier in Portland, Oregon. Dave Spear’s ’52 Chevy is a perfect example of a classic 1950s custom. The modifications are endless, and they all flow seamlessly into one graceful package. Wait until you see the interior! We traveled back east to shoot Fred Krol’s super-clean mild custom ’56 Chevrolet convertible against the Googie architecture of the Shriner’s building in Berlin, Connecticut. Fred’s ’56 shows the restraint and style that a true mild custom should be. This period-perfect drop-top looks like it could have been cruisin’ the streets of Anytown, USA in the mid to late ‘50s! Clyde Wooten’s ’58 Pontiac has the perfect “California Rake.” This Portland, Oregon, cruiser has been causing quite a stir lately wherever it goes. Clyde nailed the late ‘50s street custom look with this seldom customized body style and the use of unique and original colors. Check it out in issue #42! We have event coverage from two new shows as well as two old favorites. 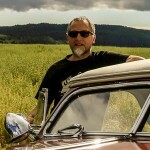 Rik Hoving takes us all the way to Sweden for the A-Bombers Old Style Weekend where he captured the amazing period-perfect customs in attendance. He also takes us on a special road trip along the west coast of Sweden where he rides “shotgun” with six traditional customs in a row. The coverage is wrapped up with some amazing shots of the 2nd Annual Custom Car Line-Up where eight select period customs gathered to be photographed as one; just as the legendary Marcia Campbell did in 1951 with a selection of Barris-built cars. “Customs by the Sea” is a brand-new show in Wildwood, New Jersey, held in conjunction with the “Race of Gentleman.” Sondre Kvipt and his brother Olav of Oslo, Norway, organized and produced the event, and Kustoms Illustrated has coverage of this historic and up-and-coming traditional custom car show. Our two old favorites include Lead East in Parsippany, New Jersey, and the KKOA “Leadsled Spectacular” in Salina, Kansas. Both shows are loaded with great kustoms and you can see them all here in the new issue! Subscribe today! And remember; only subscribers receive the glossy full-color 4 X 6” collector’s post card inserted in each mailed issue!